Length: 8 hrs. 28 min. 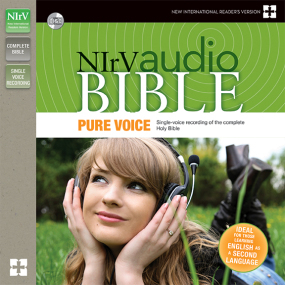 More than a Bible you listen to, the NIrV Audio Bible, Pure Voice is an experience that helps you enter into God's Word ... so God's Word can enter into you. Featuring a single voice, this complete, unabridged, and digitally produced New International Reader's Version (NIrV) audio Bible brings Scripture to life one vivid recording at a time. Location markers to make finding and keeping your place as you listen as easy as hitting "fast-forward" or "reverse"